He’s still the World’s Mightiest Mortal, though it looks like director David F. Sandberg has stripped him of the power of flight. 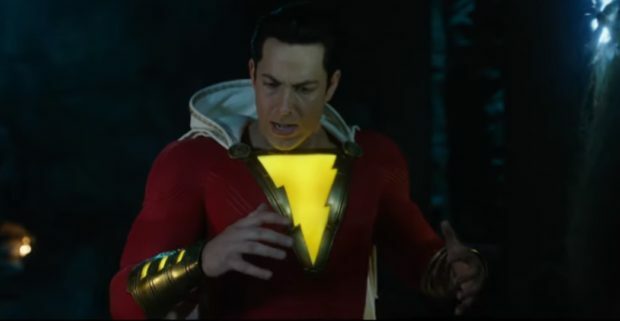 And yes, actor Zachary Levi does seem a little over-padded as the adult superhero Shazam, transformed when Asher Angel’s Billy Batson says that magic word that’s now also his name. But as it’s clear that Billy relies on Freddy Freeman (Jack Dylan Grazer) for his superhero information, Levi probably isn’t just grown-up Billy, but Billy’s idea of what superheroes are: basically overmuscled just to the edge of cartoonishness. Why am I giving that such a pass? Because there’s overtly so much this trailer gets right. Goofy charm, mystery with the old wizard Shazam, and the presence of Mark Strong as Thaddeus Bodog Sivana. What’s a bigger mystery is the addition of Djimon Hounsou as the wizard. It’s not that he’s a bad actor; it’s that they had another perfectly fine actor in the role until a few weeks ago — Ron Cephas Jones. Ah, well. It could have been a scheduling issue for reshoots. Following Aquaman’s December opening with this in February, it’s a good one-two punch for what Warner Bros. announced at Comic-Con is called the “Worlds of DC.” It’s a title that can include things like Joaquin Phoenix’ portrayal of the Joker alongside Jared Leto’s. All along, Warner Bros. has been awkwardly trying to get across this concept — DC contains a multiverse, not just a universe, and this opens the door for a brighter Henry Cavill to go toe to toe with Levi some day, just for fun.